Become a Member Join BROOD or renew your membership - it's quick and easy. After you complete the online Membership Application, you have three options for paying the $20 annual dues: either send a Check to BROOD or pay online using either your Credit Card or PayPal. 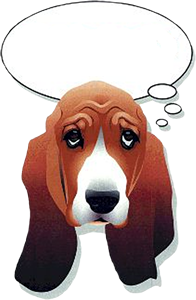 Adopt from BROOD Apply to adopt a basset hound from BROOD. Simply complete the Adoption Application and submit your non-refundable application fee of $10 by Check, Credit Card or PayPal. Become a Foster We always need foster homes for our bassets! For complete information on fostering please visit our Foster Information page. To apply to become a foster home, simply complete and submit the Fostering Application and complete and sign the Fostering Agreement (PDF file requires Adobe Reader). We'll be in touch. Signup for Newsletter Want to be informed of upcoming BROOD events and fundraisers? Go to our Newsletter Signup and you'll be in the know! The Online Shelter Referral Form which can be completed and submitted directly to BROOD online. The PDF Shelter Referral Form (requires Adobe Acrobat Reader). You can either print off a blank copy and fill it in by hand, or complete it online and then print it. Either way you fill it out, once you're done you can fax it to BROOD at the toll-free number listed on the form. Intake Report BROOD Volunteers - When first accepting a dog into BROOD, please complete and submit this Dog Intake Report as an initial evaluation of the dog. Foster homes who are submitting more detailed information on a BROOD dog should submit the Foster Dog Report form instead. Kennel Dog Report BROOD Kennel Help - For any BROOD dogs currently residing in a kennel, please complete this Kennel Foster Report form to provide or update dog information. When the report is completed, please click the SUBMIT button to send the information to BROOD. You might also want to print it for your records. The form automatically sends an email to the appropriate BROOD coordinators, with a copy to you. Foster Homes BROOD Foster Homes - Please use the Foster Dog Report form to provide or update dog information. When the report is completed, please click the SUBMIT button to send the information to BROOD. You might also want to print it for your records. The form automatically sends an email to the appropriate BROOD coordinators, with a copy to you. If you have veterinary expenses for your foster dog, please use the Veterinary Expense Reimbursement Form and submit it, along with the pre-approval email and your foster dog's veterinary bills, following the instructions on the form. For complete information on fostering please visit our Foster Information page. House Visits BROOD Volunteers - This form is used for both Adoption Applicant and Foster Applicant Home Visits. Please print the House Visit form and the House Visit Guidelines (PDF file, requires Adobe Acrobat Reader) and take them with you to use when you do a house visit for a potential adopter or foster home. For Adoption Applicants, also print a copy of the PDF Disclosure Statement, the PDF Sample Contract and PDF Child Waiver Addendum (if appropriate) and leave them with the applicants. Once the Adoption Applicant or Foster Applicant House Visit is complete, please use the online House Visit form to report the results and be sure to click the SUBMIT button to send the information to BROOD. You might also want to print it for your records. The form automatically generates an email to the appropriate BROOD coordinators, with a copy to you. Adoption Contracts BROOD Volunteers - When completing an Adoption, please print this Adoption Contract (or if it is a puppy, use the Puppy Adoption Contract) and have the adopter(s) sign it when the dog is turned over to the new owner. Submit Success Story If you have adopted a dog from BROOD, you can have it featured on our website as one of our success stories. It's easy, just use our Success Story form and make a $10 tax-deductible donation for each photo you submit.